Interactive screen printing is a great way to impress your guests! We screen print on site for events of all sizes with opportunities for every budget. Offer a single design or different options that patrons can mix-and-match for a customized shirt (up to 4 screens). We can set up inside or outside; all we need is a standard power outlet. We provide everything at no cost to you--setup, printing, blank t-shirts, point-of-sale. You provide the designs. We determine the sale price and print on demand. Green Pea Press will give back 20% of sales from all shirts sold at your event as long as the minimum quantity of 24 units has been reached. If we sell less than 24 items, the organizers will need to cover the remaining number of shirts to meet the minimum (at a 20% discount on the sale price). We will give back 20% of the shirts sold at full price, either as credit to reduce your cost of covering the remainder, or as a separate check. 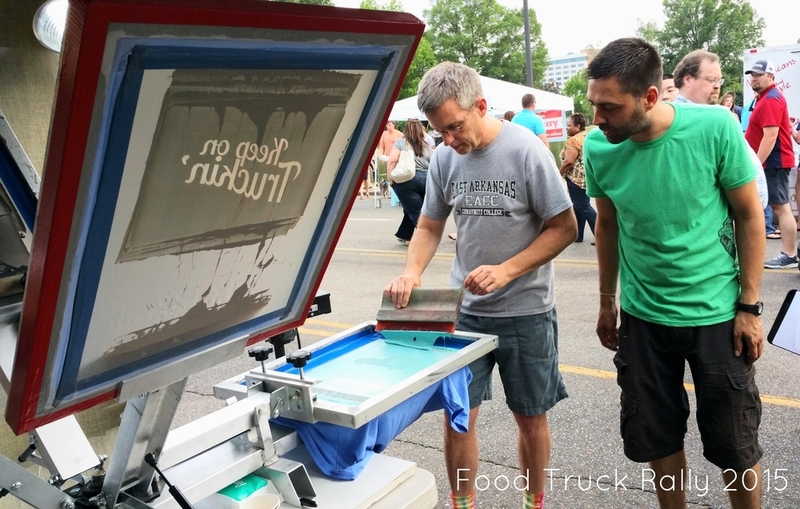 Hire us for on-site printing in town: $50 setup fee, plus $9 per shirt (50 shirt minimum). You provide the designs and determine your own sale price; provide your own point-of-sale for the t-shirts at the event and keep 100% of the revenue. For out-of-town events, the setup fee is determined by distance and length of event. For more information about on site printing and whether we would be a good fit for your event please fill out our On Site Printing Application or contact us at info@greenpeapress.com or 256-924-0451.